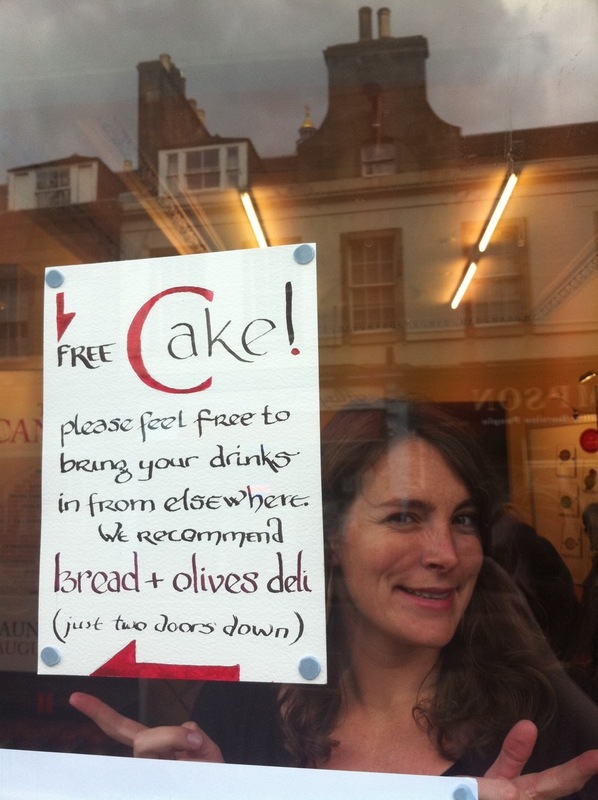 ‘Free Cake’ says the enticing sign on the door. Inside are leather armchairs, and reams and reams of beautiful, sumptuous books. What was a disused shop has popped up for this week only as a special Canongate Books Pop-Up Bookshop. There are bargains to be had and readings to be heard – paperbacks are £5 and hardbacks a tenner,with a bargainous £15 off Alasdair Gray’s autopictography. Some famous faces will be reading from books that are not their own, convinving us to love them too – Michel Faber, James Robertson and Simon Callow are among those giving free readings at 5.30pm each day. Last night, the Pop-Up Bookshop played host to Electric Bookshop, which explores the future of the book. 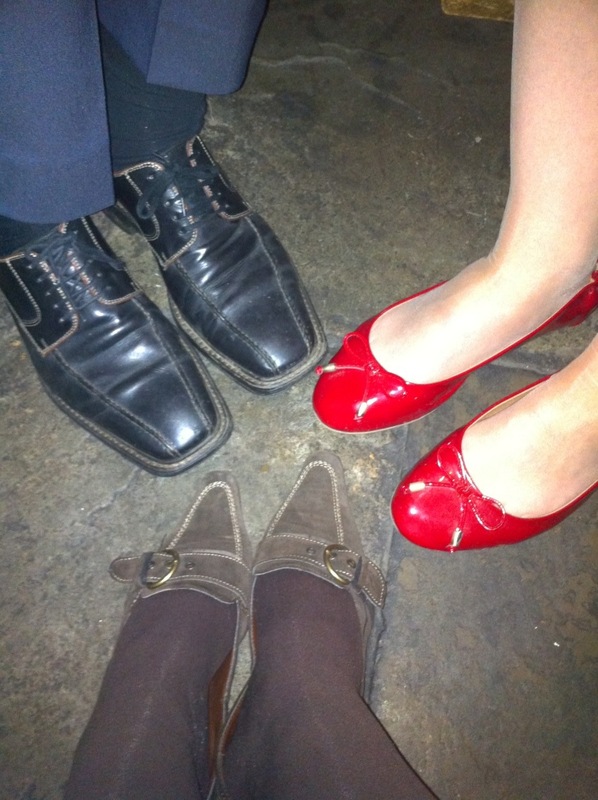 Run by Padmini Ray-Murray and Peggy Hughes, Electric Bookshop has a regular series of events to talk about publishing and digital development: there was a tweet-up going on, so it was nice to see some of the Twitterati there. I headed along to see US National Book Award winner Jaimy Gordon talk about Lord of Misrule, and Australia’s Malcolm Knox discuss his latest novel, The Life. Both are tales of sporting obsession – Jaimy’s based on her years spent working at a racetrack and Malcolm’s inspired by his fairly recently discovered affinity for surfing. On the way to get Malcolm to sign a copy of his cricket-based Adult Book (no, I don’t like cricket, it’s for a friend), I bumped into Steven Amsterdam, standing next to Steven Amsterdam. 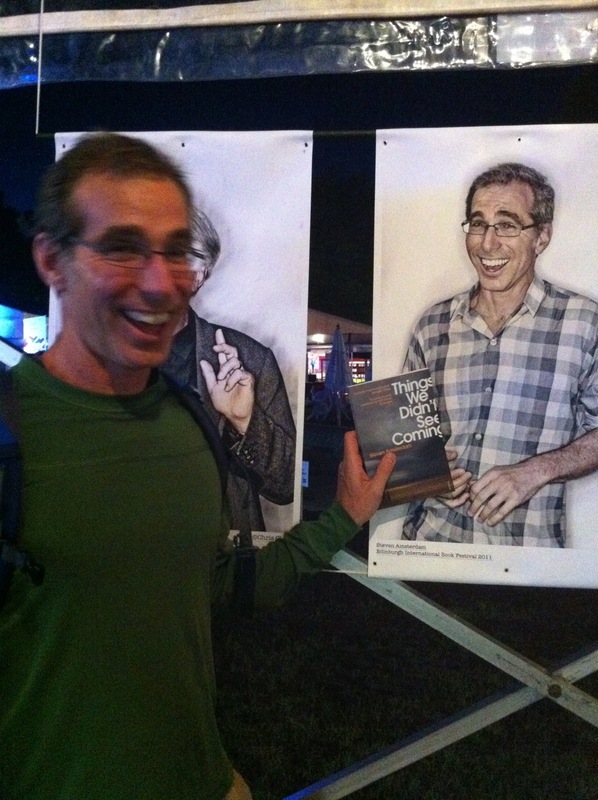 He delightfully signed a book for me, then grinned as I made him stand next to his portrait for a cheesy pic. I even made him hold his book. He went on to tell me about his early career, upon moving to Australia, as a pastry chef (‘it was on the immigrant skills list’) and about being paid to live in a Manhattan apartment block. What a guy. 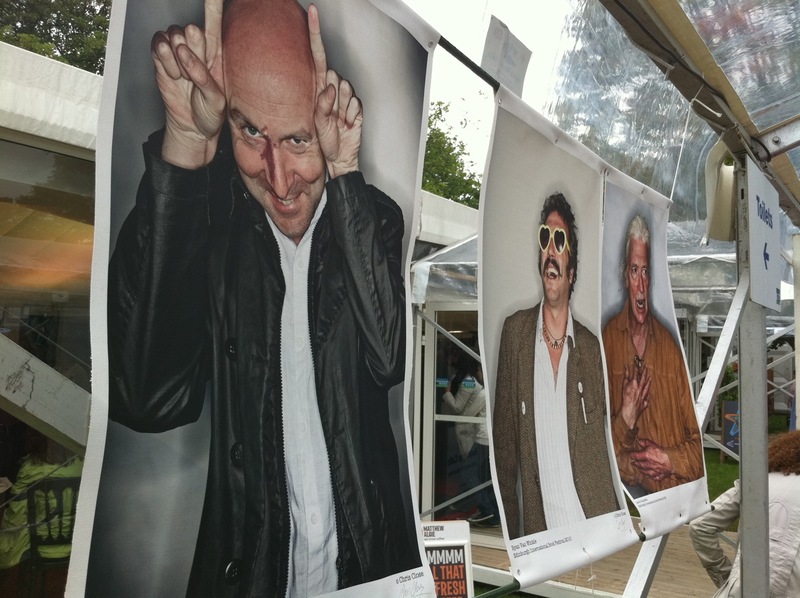 The author portraits that hang around the Book Fest walkway are added to daily, as photographer Chris Close captures the souls of yet more visiting writers. 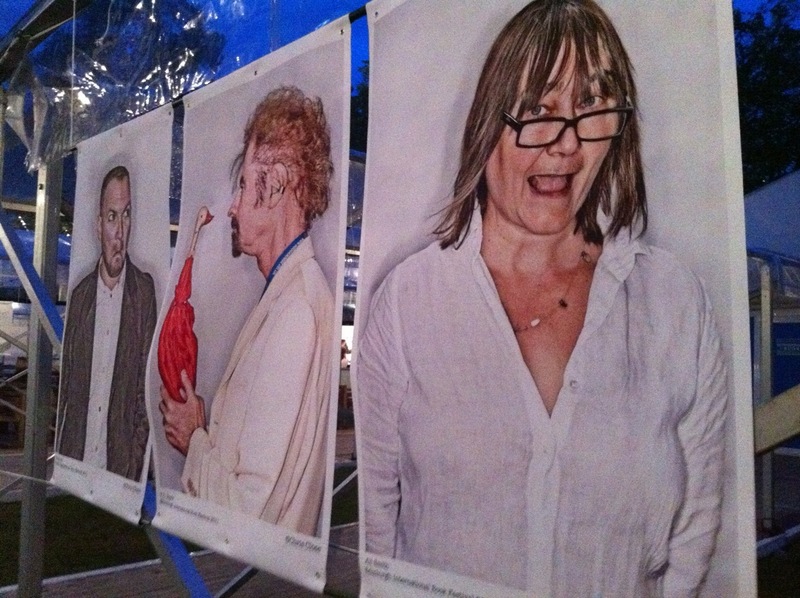 I’ll put up a gallery of them soon, and add new images each day – here’s a few to keep you going. 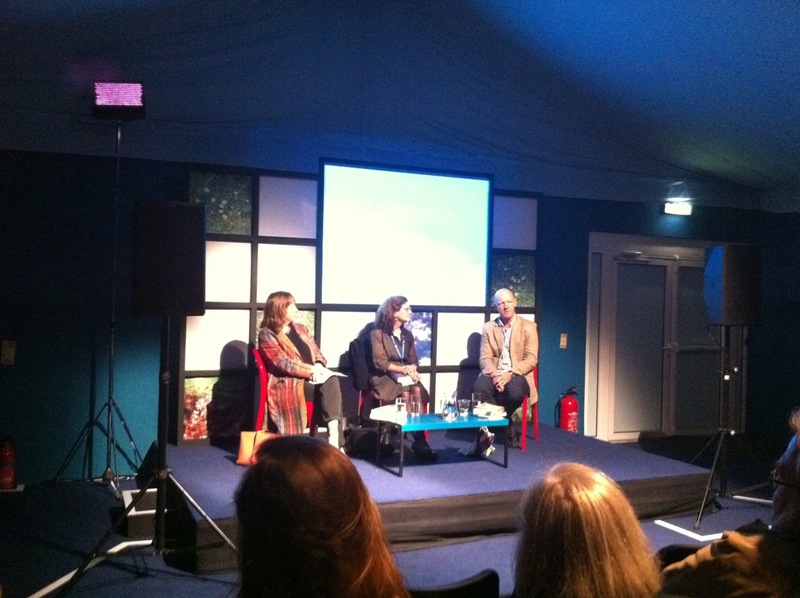 That’s Ali Smith with her mouth open, next to TC Boyle and his umbrella, and [on the right] Chris Brookmyre with the horns and Ryan van Winkle in the glasses. 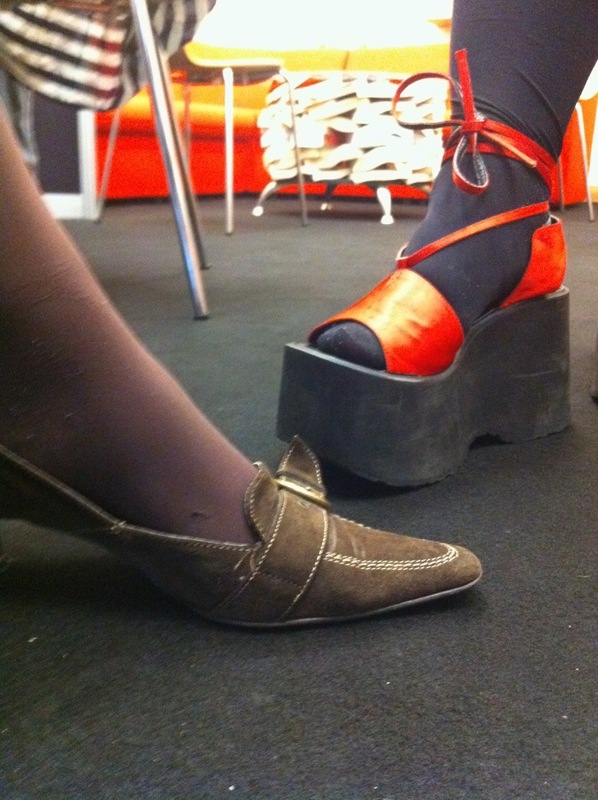 The shoe challenge got a little pointed, as I sported some buckled brown suede shoes with a witchy tip. Today’s photographer was editor Rebecca Hearne, otherwise known as @bookshop_becky, so it seemed appropriate to get a snap in the EdBookFest shop.